Cinderfella is a comedy film adaptation of the classic Cinderella story, with most characters changed in gender from female to male. Jerry Lewis starred as Fella, and co-starred with Anna Maria Alberghetti as Princess Charming. Cinderfella was released December 16, 1960 by Paramount Pictures. The Muscular Dystrophy World Premiere Benefit was located in Chicago. A star-studded event included the lighting of Christmas lights in front of the Chicago Water Tower at 806 North Michigan Avenue. This was Jerry Lewis’ answer to the classic Cinderella story. When his father dies, poor Fella is left at the mercy of his snobbish stepmother and her two no-good sons, Maximilian and Rupert. As he slaves away for his nasty step-family, Maximilian and Rupert attempt to find a treasure Fella’s father has supposedly hidden on the estate. Meanwhile, hoping to restore her dwindling fortunes, the stepmother plans a fancy ball in honor of the visiting Princess Charming whom she hopes will marry Rupert. Eventually, Fella’s Fairy Godfather shows up to convince him that he has a shot at winning the Princess himself. 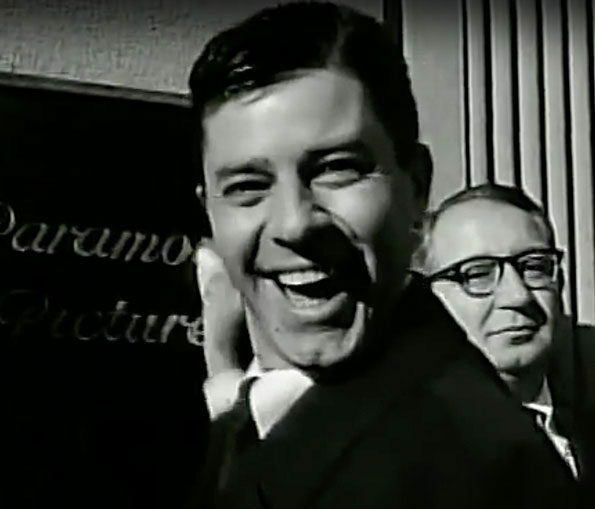 Jerry Lewis “arrived” in Chicago in a pumpkin coach to promote funding for the Muscular Dystrophy Association and for the world premiere of Cinderfella at the Woods Theater at Randolph Street and Dearborn Street in Chicago’s Loop. Lewis also signed a contract as a West coast scout for the Chicago White Sox at Comiskey Park during his visit. Enjoy the surprise appearance of familiar faces. Jerry Lewis, as Fella, and Anna Maria Alberghetti, as Princess Charming, with the Count Basie orchestra in Cinderfella midnight dance scene. When Jerry Lewis ran up the stairs at the end, he collapsed as soon as he was out of frame and was rushed to hospital. Lewis was hospitalized for a “cardiac episode” and filming was postponed for a month.